Susan B. Anthony has a mobile app. The home and museum of one of the area’s most prominent citizens will be part of a mobile app featured in the New York State Path Through History initiative. 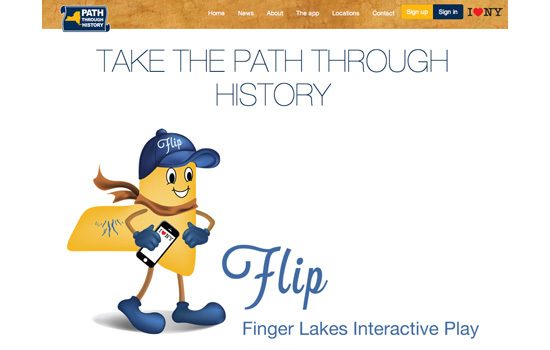 It is among 12 historic sites in the region using a scavenger hunt concept as the basis for the app called FLIP: Finger Lakes Interactive Play. A formal launch of the app, a demonstration and reception takes place at 3 p.m. Thursday, July 17, at Student Innovation Hall at Rochester Institute of Technology. FLIP highlights multiple historic sites in the nine-county area of the Finger Lakes Economic Development Council as a way to enhance visitor experiences to well-known landmarks including: the Arcade and Attica Railroad, Clara Barton Chapter 1 of the American Red Cross, Ganondagan State Historic Site, The George Eastman House, Historic Palmyra, the Jell-O Gallery and Museum, Medina Railroad Museum, the National Susan B. Anthony House, the Rochester Museum and Science Center, Seneca Falls Museum of Waterways and Industry, Sonnenberg Gardens and Mansion State Historic Site and the Women’s Rights National Historical Park. Members of each of the organizations have been invited to attend the demonstration at RIT. Path Through History is an online site with links, images and background information about New York’s historic and cultural sites. The new app is the Finger Lakes region’s contribution to the state’s Path Through History initiative to help increase visitation to, and awareness of, the sites, as well as providing enhanced informational resources is a means to spur tourism, one of the key economic development areas highlighted by New York Gov. Andrew Cuomo. Pathways Through History is one of several initiatives, along with the New York Outdoors, Taste of NY and I Love NY campaigns, to promote tourism across the state. Since these have began, more than $4 billion in revenue has been generated, according to the governor’s office. “FLIP will be a great way for kids and adults to interact while at the site or even before they get there for a tour,” said Rick Lagiewski, senior lecturer in RIT’s College of Applied Science and Technology, School of International Hospitality and Service Innovation, and principal investigator for the grant. The FLIP app is free and available on the New York State Path Through History website. It was developed over the past year through a collaboration between the Finger Lakes Path Through History Workgroup and a multidisciplinary team at RIT. The RIT team includes Lagiewski and Shaun Foster, assistant professor in RIT’s College of Imaging Arts and Sciences, School of Design; Stephen Jacobs, associate professor, and Joe Pietruch, lecturer, both faculty in RIT’s B. Thomas Golisano College of Computing and Information Sciences, School of Interactive Games and Media. The latter two are also part of the MAGIC Center. The team was awarded a $100,000 grant from the Finger Lakes Regional Economic Development Council.